I'll share more about the wedding later and a great honeymoon in Italy later... Since then, we returned home to find ourselves in the hubbub of Christmas. I had baking to get done and presents to buy, a baby shower to host, a house to decorate, a trip to Edmonton for the holiday, then Lake Louise for more fun. It was a lot. After some great exercise (but lots of eating still) in Lake Louise, we rang in the new year and made one of those typical pledges to get out a bit more and make some more great food choices in 2014. We're usually pretty good but the lead-up to the wedding led to more eating out than I am comfortable with and I like how I feel when I'm eating good food that I've made. I didn't want to start the year with a list of "resolutions" that would just cause me to cringe in an October reflection... that said, there were a few things that I definitely wanted to improve upon. One of those things was eating breakfast consistently. And, no, I don't mean to stop at Starbucks or McDonald's for a breakfast sandwich that is $3+ more than I need to spend if I took some time to plan ahead and make this a priority. It's annoying... I only have myself and the dog to tend to in the morning but somehow between getting myself functioning and ready, walking the dog, then getting out the door, I don't think enough about eating. I sure do manage to brew my coffee though. Priorities. So, instead of fighting it, I am making a new plan. I love steel cut oats. They have a great texture, are good for you, and manage to keep me going until lunch time... when I take the time to make them. Well, with an already challenging-for-me morning, I certainly wasn't fooling myself into thinking that I would be waking up about 30 minutes earlier so that I would have time to cook said oats. But I could easily make them up the night before. 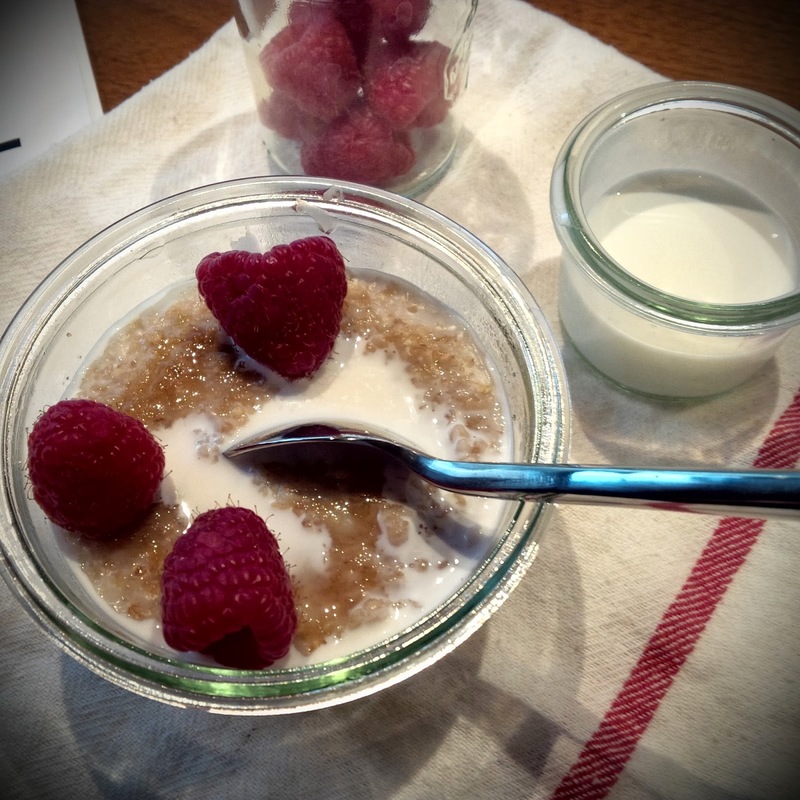 I've been making a double batch of McCann's Irish Steel Cut Oats, which are my current favourite. Then I portion it out into beautiful Weck jars. 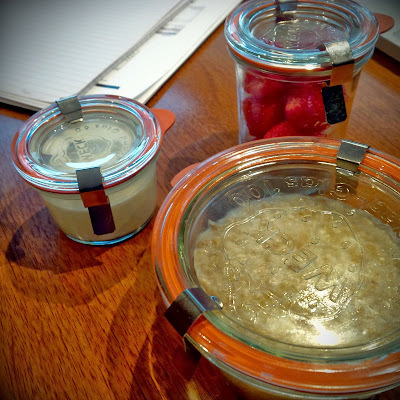 A double batch will partially fill eight 500 mL Weck jars, leaving room for whatever you like to season your oats with. I add a bit of brown sugar and cinnamon on top of the warm oats then seal the containers. Once they have cooled a bit, I'll transfer them to the fridge for a quick grab in the morning. If I have time at home, I can microwave the oats for 60-70 seconds for a quick breakfast. Or I can put the jar into my lunch bag and eat at the office. My current go-to includes bit of cream, cinnamon, and fresh berries. I can't get enough. If 21-days of repetition makes a habit, I am doing well! Plus, there is something infinitely more civilized about a breakfast at your desk when the containers are glass, the spoon is metal, and the napkin is cloth. It's practically luxurious... well, as luxurious as eating at your desk can be. Hey, I'll take it. It's better than the alternative.